I've had a bit of a mixed week, some of it has been great and some of it not so much. The debacle surrounding our mortgage continued into this week, it caused me a heck of a lot of stress. So much so that I ended up getting ill and having an incredibly miserable couple of days where I would get home from work at 5.30 pm and just go straight to bed until 7.00 am the next day. Thankfully, on Thursday we received the news that the risk department of the bank were happy with Matt's visa situation so they would give us a mortgage. The financial advisor kept telling me that our case was really complicated when it was anything but, it was frustrating. On Thursday it was the one year anniversary of my grandfather's death, I took the afternoon off work and a bunch of us took my nan out for lunch and a potter around. It was nice and without much emphasis on how crap it is now that my grampy isn't around. He wouldn't have wanted us moping around after him. Here's a round up of my week. Our house has a roof!! Cardiff has a gold postbox! The rugby season has kicked off with a friendly yesterday. We lost by five points but it was so good being back at the Cardiff Arms Park. Fingers crossed my season ticket will arrive this week. 1. My haul, oops! 2. Present from my mum for the guest room. 3. Goodies for my hair and eyes. 4. 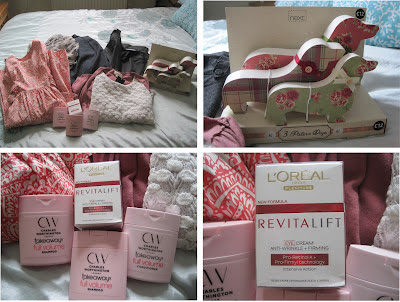 L'Oreal Revitalift, I'm planning a post about this in the next few days. Lovely summer dress from Peacocks. Reduced from £22 to £12 but I got it for £10 due to a fault on the zip. It's my fixer-upper dress. By fault on the zip I mean that there's a gaping hole in the back of the dress where the zip has come away from the dress. 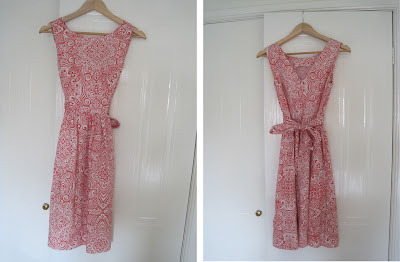 I;m sure you can fix the dress, especially at only a tenner and it being so pretty! Stick some buttons on it instead!